Welcome to River Haven! 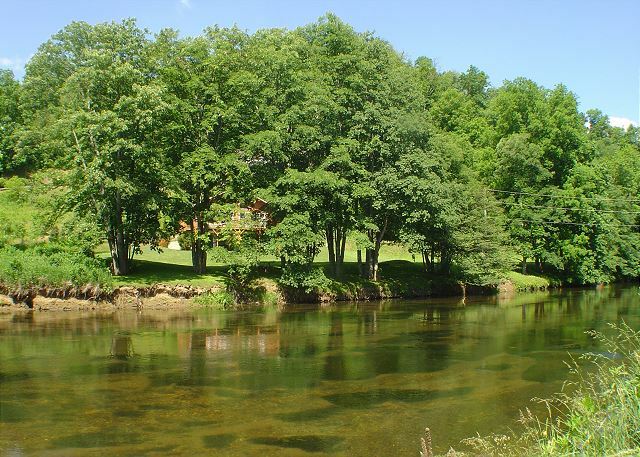 Perfect river frontage and conveniently located between West Jefferson And Boone. Fire Pit by The River. Relax in the hot tub under the covered patio. Living room with gas burning fireplace. Open living room / dining area. Fully equipped kitchen. Electric stove, microwave, dishwasher, full size refrigerator, toaster and coffee maker. King size bed in the master suite with private full bath. Master bedroom also offers walk out access to the open deck. 3rd bedroom with full size bed. 3rd bedroom also offers walk out access to the open deck. Full size bedroom offers additional TV. Outdoor dining area with propane grill. Spacious deck for all your family and friends to gather. 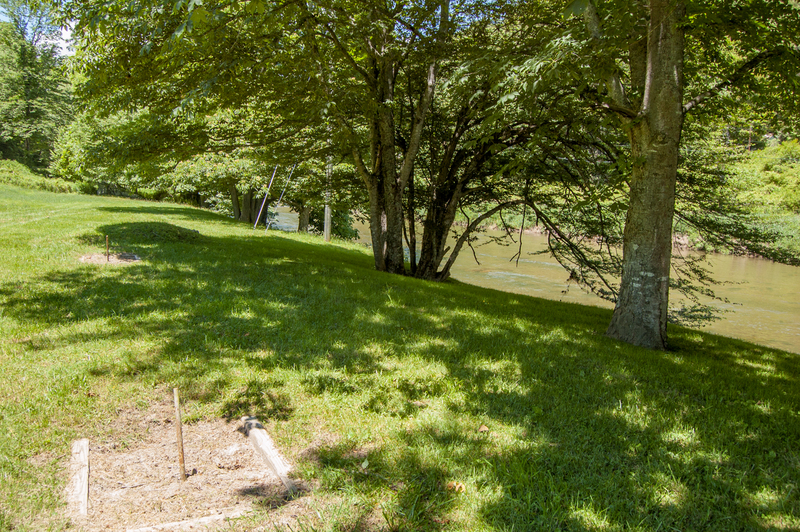 Horseshoe Pits by The River. Additional view from across the river. Large trees help preserve the privacy. Covered lower level also offers ping pong table and sitting area. Nice, shady sitting area by the river. Lots of windows to enjoy the river view. 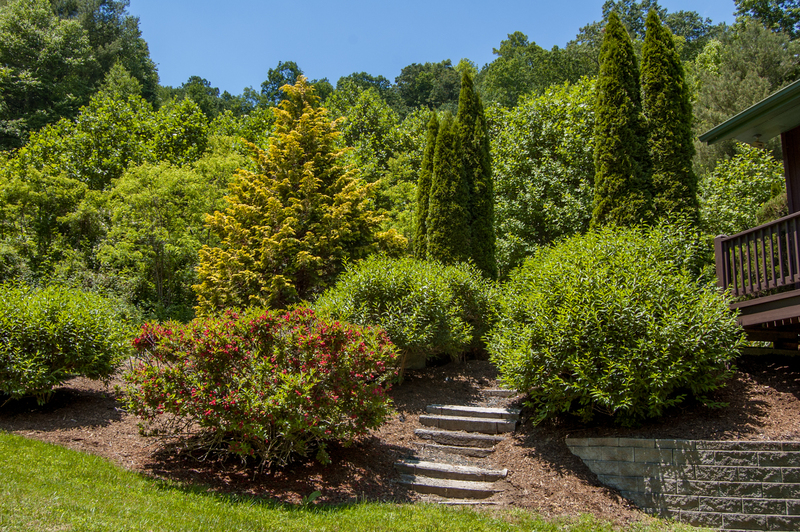 Nice landscaping with walking paths to the river access. 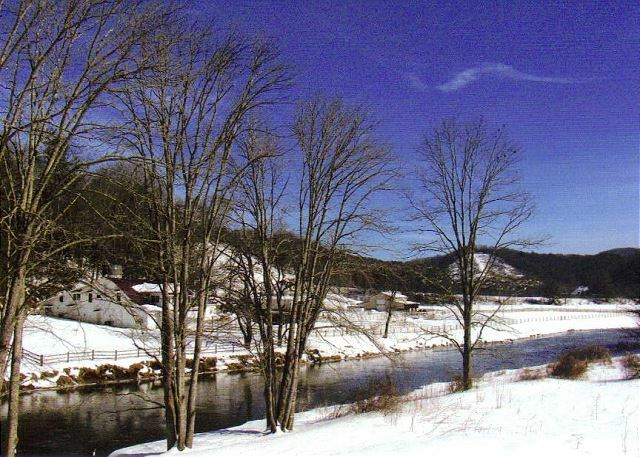 Winter view of the New River! Ski resorts within 20 to 40 minutes. 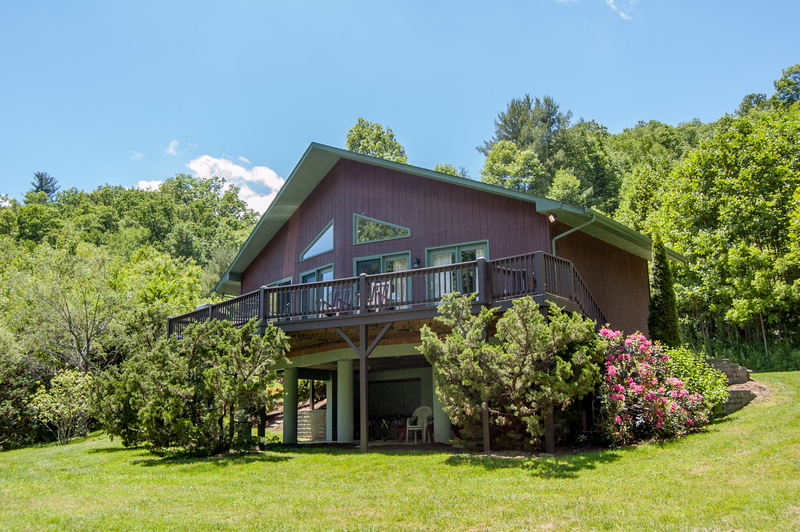 "RIVER HAVEN" - PRIVATE RIVERFRONT CABIN WITH AMAZING VIEWS - INCLUDING FROM THE HOT TUB! -	The New River - in your front yard! 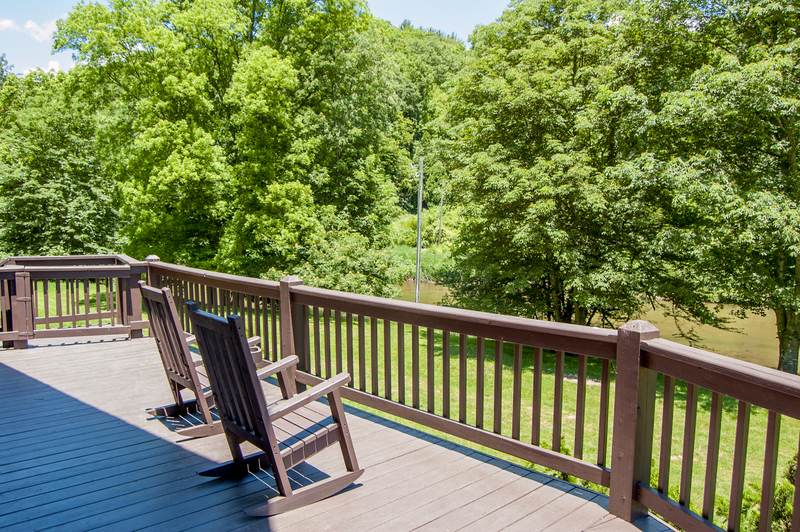 Sit on your large, private deck and watch the river roll by. Or stroll across your front lawn and step directly into the water! 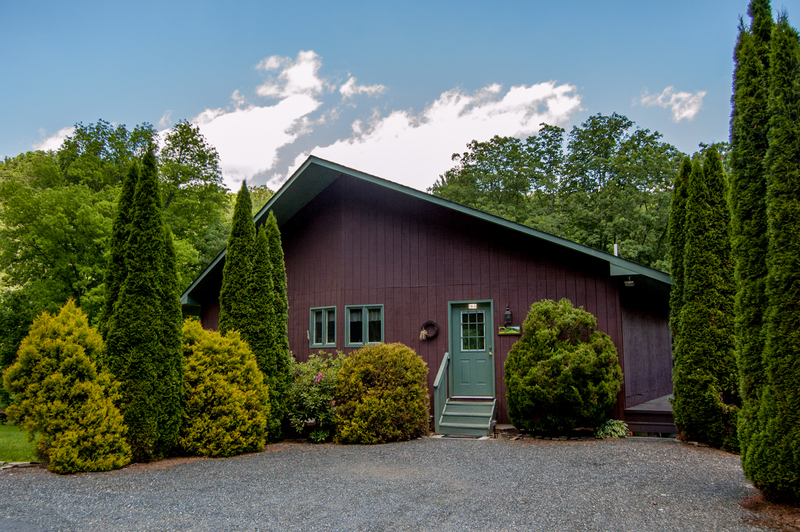 This charming cabin is literally steps from the New River, and fully outfitted with all the comforts of home. In a setting like this, you'll hate to go inside. Grill and entertain on the large deck, then close out the evening with a campfire on the banks of the river. 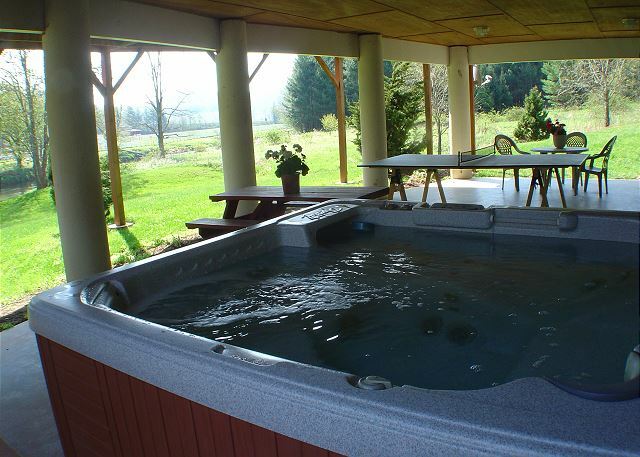 Or soak in your luxurious, private hot tub - also with a river view! The huge, flat front yard is perfect for a flag football game. 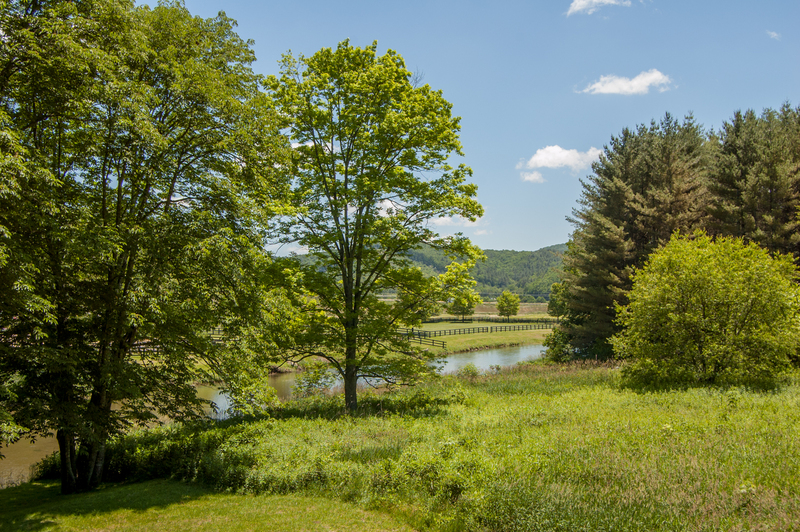 Wherever you look there's simply stunning scenery and open spaces - no other homes crowding in on your serenity. 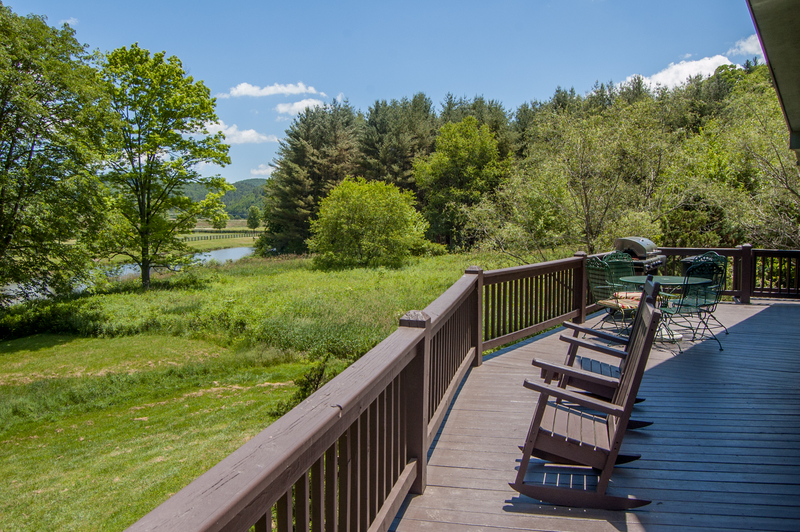 The view from the deck is amazing - river, meadow with wildflowers, and the mountains beyond. Sit and enjoy an adult beverage while watching the kids run around the yard. The river is shallow and slow-moving - safe and enjoyable for all ages. The deck is outfitted with a table and chairs, plus gorgeous rustic benches made by a local craftsman. On the lower level you'll find a large covered patio with additional seating and dining options, a private hot tub and a ping pong table. Plan a picnic down at the water's edge, or warm by the fire pit, with built-in seating and a billion stars above. 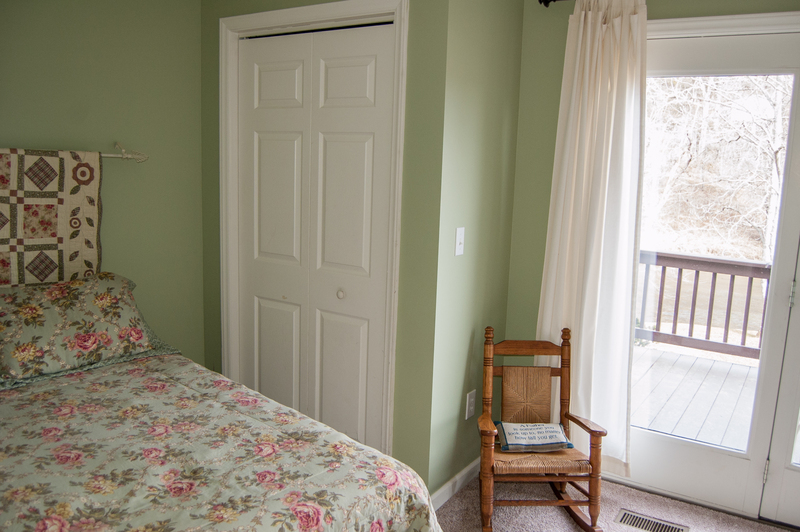 The comfort and relaxation continues inside your High Country Haven. 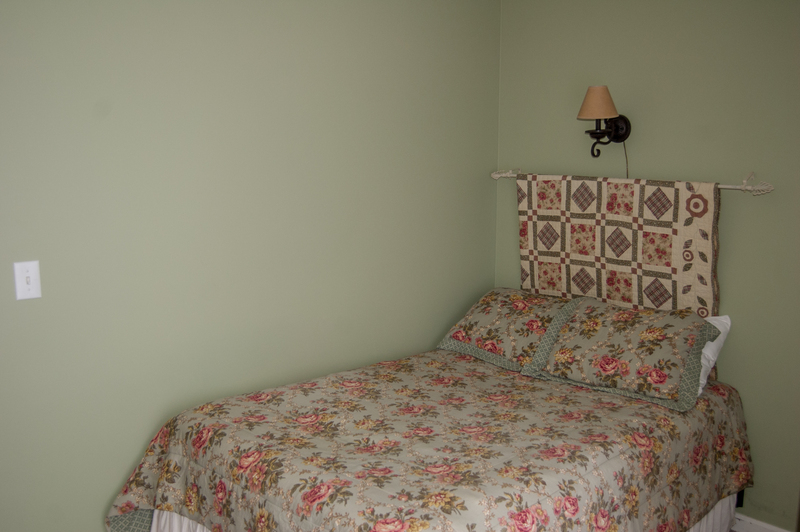 The master suite offers a king bed and en suite bath. The house sleep 6 total, with the addition of a queen and a full-size bed and an additional full bathroom. A gas log fireplace keeps the great-room cozy, and 2 TVs keep the family entertained. We've set you up with board games, puzzles, books and movies, for quiet evenings at home. 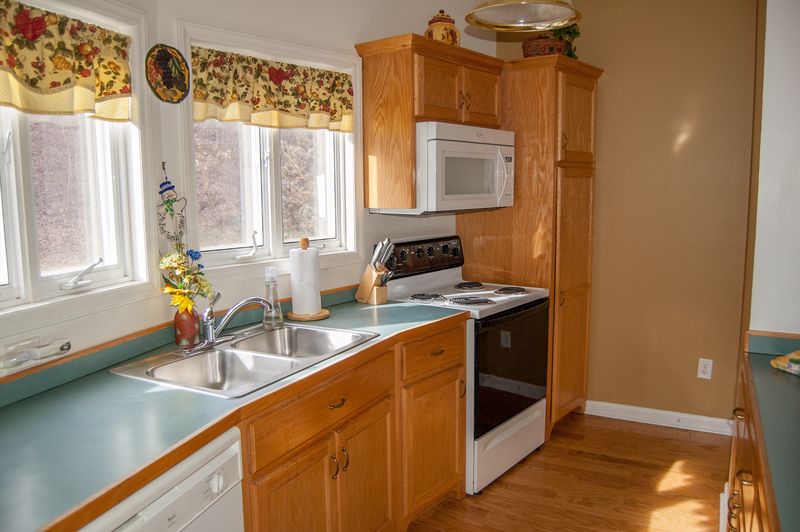 The kitchen is beautifully equipped with microwave, dishwasher, coffeemaker, toaster-oven, blender, crock pot, and all the dining accessories you might need. There's also a washer and dryer for your convenience. With all the comfort and beauty that River Haven has to offer, you won't want to leave. You've picked the right spot for an unforgettable mountain vacation! 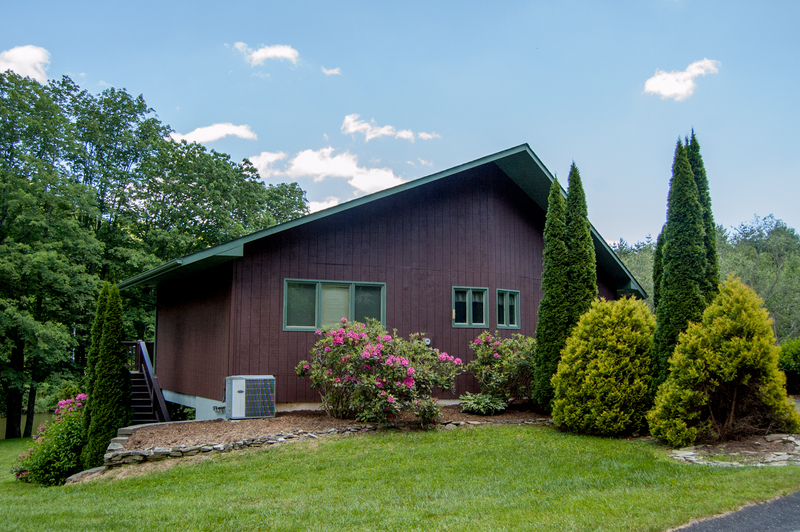 Riven Haven is just a short drive to the Blue Ridge Parkway, Boone, or West Jefferson. The ski resort at Sugar Mountain is only 40 minutes away. And no matter what season it is, there are always a myriad of activities to enjoy, including hiking, fishing, canoeing, tubing, horseback riding, volleyball and badminton during the warmer months, or sledding, snowboarding, skating - and of course skiing - all winter long. River Haven is in the heart of the High Country, where gorgeous scenery awaits you at every turn. In the quaint mountain town of West Jefferson you have restaurants and terrific shopping, including antique stores and art galleries. There's even a movie theater. This is small-town Americana at its finest. Or - just kick back by the river and feel the stress of the city melt away? "We enjoyed our time at the cabin and will be returning! " 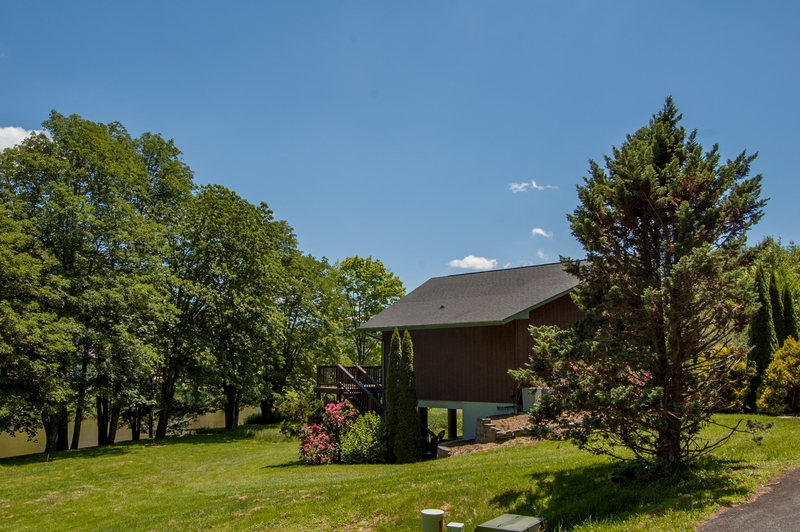 "Nice quiet location but just off the main highway so you can easily access Boone or West Jefferson. Rental company was easy to work with; hope to rent this house in the summer." "We visited with family. 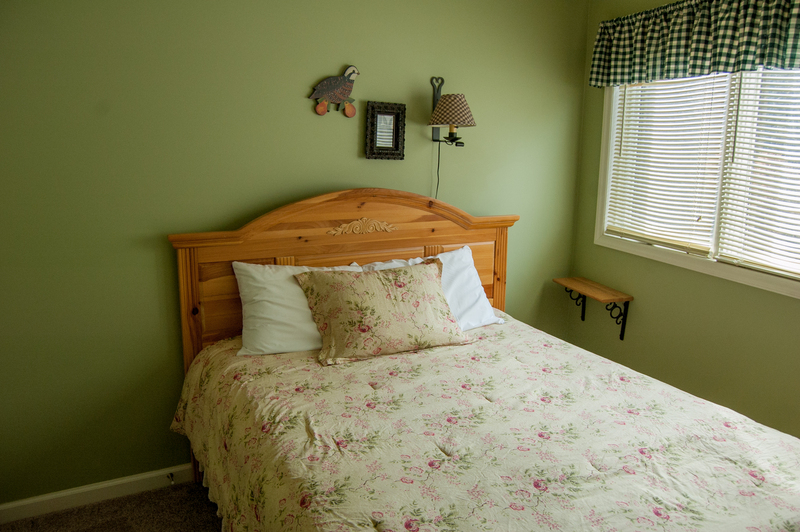 This is cozy place with 3 bedrooms and close to attractions Boone / Mystery hill tootsie railroad etc. Overall nice place to spend time with family. In summers I feel it would be much better as you can go to the river etc.. we were there for fall colors. " "The house was wonderful, had A/C unlike many properties up here, comfortably decorated with all the amenities (cable, WiFi, if needed.) property also sits riverside in a quiet neighborhood that makes for a very relaxing stay." " We had a great weekend at River Haven. Best mountain vacation ever! The home, views and access to the river was fantastic. " "Overall the house is great. The main issue during our stay was a very obvious bug infestation, mainly carpenter ants everywhere. Other minor issues need attention but we enjoyed our stay. " Thank you for the feedback, as you are aware we did come out to spray during your stay for ants but it can take a few days to take effect. We are glad to hear that overall you enjoyed your stay! 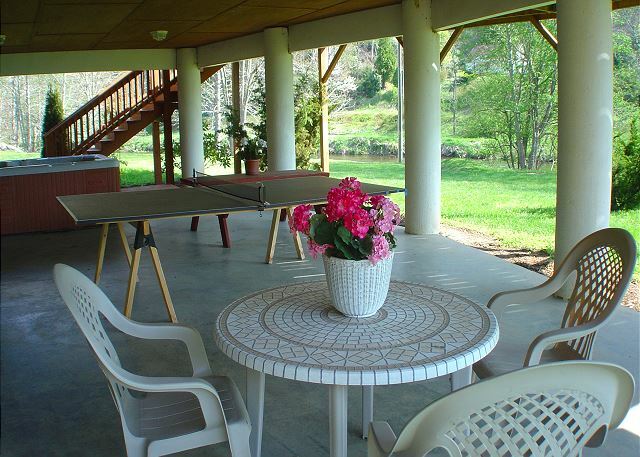 "Excellent vacation rental - Beautiful spot on the river. The house could use new bathroom towels." Thank you for the excellent review. Bathroom towels have been replaced. "It was a great place for family and friends to get together to celebrate my daughters. Very clean and great people to work with. Overall experience was great. " 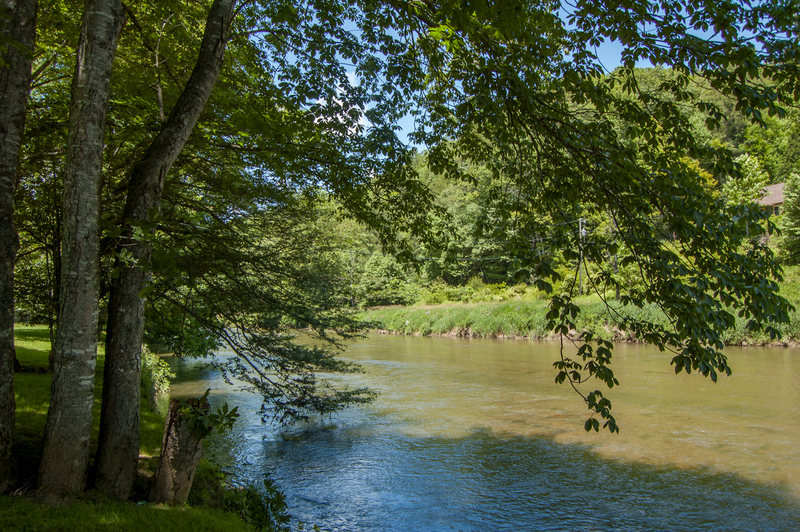 "At River Haven, we enjoyed relaxing on the porch by the New River and pitching horseshoes. The neighborhood was very quiet. We visited West Jefferson, went canoeing on the New River, and rode bicycles on the Virginia Creeper Trail. " Thank you for the wonderful words. 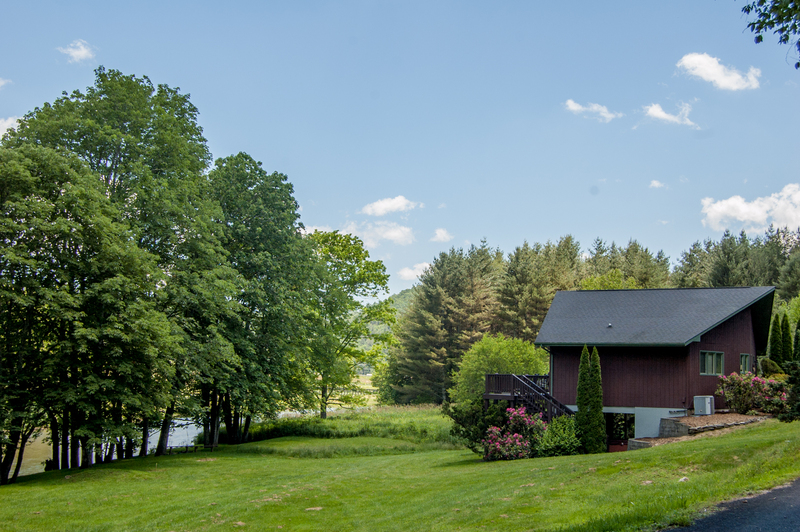 This cabin is a sure win with the amazing river access and location, it's hard to beat! "We had a great weekend stay. We were attending Merlefest so we were thankful that the house was not far off of 221. They house was clean and well maintained. The view was so beautiful. We want to come back in the summer so we can enjoy tubing in the river. Everything was fine about the house and we enjoyed it even though we were only there in the mornings and late evenings due to attending the bluegrass festival." "This is a great house on the New River. We've never stayed in Fleetwood before. West Jefferson is not far away. We went there for lunch one day and walked around. This house was clean and we had a good time by the fire pit on the river. The rental company was easy to work with and answered my emails promptly. Overall it was a great stay Thank You." "My family and I stayed in this cabin for a short little getaway. We enjoyed getting to use the hot tub and the comfy open living room. The lake view was also very nice. " "Clean, everything as described. Would be a great summer rental right on the river! " "We had the most wonderful time during our stay at "River Haven". The weather was perfect, the views were perfect. The house is very nice and rustic and situated right on the river. The deck was great for relaxing with our evening drinks and grilling. We had a blast playing ping pong on the lower level. We hope to be able to rent this home again and we highly recommend "River Haven". " "Lovely house;beautiful view;everything provided including gas for grill, soap,tissue,etc;absolutely NO glitches. We had a wonderful weekend. People with us took rental information so they could rent in the future." "We had an awesome vacation! Perfect place to stay! We enjoyed 2 years ago and will definitely be back to stay there again! " "We really enjoyed our stay at River Haven. The house was very clean, in good shape and convenient to Boone. The only problem was with the Hot Tub location. It is located under the deck on the river side of the house. Privacy is not the issue but access is. If you are wanting to get in it you have to walk down the yard on the side of the house to get to it. This is especially a problem at night because there is no lighting on the sides of the house and it is very dark at that location. For that reason we did not use the Hot Tub at all. I would have prefered it being located on the deck." Thank you for the feedback. The hot tub is located on the lower level patio / game area and there's actually steps off the left hand side of the deck that lead down directly to the hot tub. There's also exterior porch lighting that easily illuminates the steps as well as the area below. Future guests if you have any questions or experience any issues during your stay please call us so we can help quickly remedy any situations.